Less than two weeks ago, we spotted a very small, grey, dog-like animal in broad daylight rolling around in our street. We took pictures and grabbed the binoculars. The little fox was so skinny and had sores all over its body. It's eyes were barely open. I honestly thought this was going to be Operation Put-This-Poor-Animal-Out-of-His-Misery. We have the most awesome nature center approximately 30 minutes away from our house. I called them to get their advice. And thanks to them, our rescue mission began. We placed the trap in our front yard under a pine tree. Days went by and still no fox. Thankfully, our outdoor cats stayed out of the trap. I put the trap away when we went out of town for Labor Day weekend, and put it back out when we got home but I moved it just a bit. I hid it under another pine tree in the front yard, and sprinkled cat food at the opening on the grass. That did the trick because we caught him on Saturday evening. Because the nature center was closed for the day, we had to keep him with us overnight. 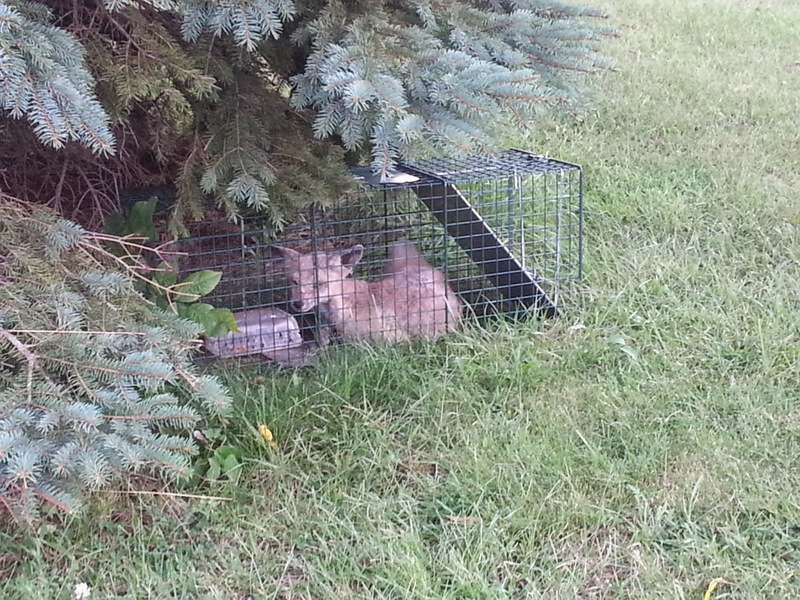 We put a dish of water in the trap and placed it up by our house, and gave him more cat food. We also covered the trap with a blanket. I worried about him so much that night! This truly was his only shot at survival. He was living on bugs at this point. The nature center called me in the morning and, based on the symptoms I gave them, diagnosed our little fox with mange over the phone. Mange is nasty, itchy, painful, and transmittable to other animals. But it is treatable, and those awesome saintly nature center people wanted to make him well again. So Kayla and I had the honor of delivering him. They thanked us for bringing him there when we got there. Saints, I tell you. Sometimes in a world where there is so much bad, good things really do happen, just for the sake of being good. I love animals, and I love people that love animals. And I hope that my daughters take notice of every spider I put outside, every worm I move off the driveway, every turtle I stop and help cross the street, and the little fox we saved. We were told we are welcome to call and check on his progress, and our fox might even come back to our neighborhood to be released when he's well again.